His Holiness the Fourteenth Dalai Lama, Tenzin Gyatso, was born on July 6, 1935 to a peasant family in the small village of Taktser in northeastern Tibet and was recognized at the age of two as the reincarnation of His predecessor, the Thirteenth Dalai Lama. 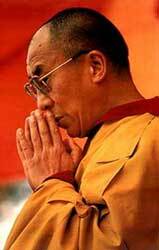 The Dalai Lamas are the manifestations of the Buddha of Compassion, who chose to take rebirth to serve humanity. Dalai Lama means Ocean of Wisdom; Tibetans normally refer to His Holiness as Yizhin Norbu, the Wish-Fulfilling Gem, or simply Kundun, the Presence. When the Thirteenth Dalai Lama died in 1935, the Tibetan Government had not simply to appoint a successor, but to discover the child in whom the Buddha of Compassion would incarnate: the child need not have been born just at the death of His predecessor, or even very soon thereafter. As before, there would be signs of where to search. For example, when the Thirteenth Dalai Lama's body was laid in a shrine facing south, His head turned to the east twice, and to the east of his shrine a great fungus appeared on the east side of a pillar of well-seasoned wood.The Regent of Tibet went to the sacred lake of Lhamoe Lhatso, where Tibetans have seen visions of the future. There he saw, among other things, a monastery with roofs of green jade and gold and a house with turquoise tiles. A detailed description of the entire vision was written down and kept a strict secret. In 1937 high lamas and dignitaries were sent throughout Tibet to search for the place seen in the vision. Those heading east were led by Lama Kewtsang Rinpoche of Sera Monastery. In Takster they found such a place and went to the house, with Kewtsang Rinpoche disguised as a servant and a junior monk posing as the leader. The Rinpoche was wearing a rosary of the Thirteenth Dalai Lama and the little boy, recognizing it, demanded that it be given to him. This was promised, if the child could guess who the wearer was. The reply was Sera aga (in the local dialect, a monk of Sera). The boy was also able to tell who the real leader and servant were. After many further tests, the Dalai Lama was enthroned in 1940. In 1950, at the age of sixteen and still facing nine more years of intensive religious education, His Holiness had to assume full political power when China invaded Tibet. In March of 1959, during the national uprising of the Tibetan people against Chinese military occupation, He went into exile. Since then He has lived in the Himalayan foothills in Dharamsala, India, the seat of the Tibetan Government-in-exile, a constitutional democracy since 1963. Dharamsala, aptly known as Little Lhasa, also has cultural and educational institutions and serves as a "capital-in-exile" for 130,000 Tibetan refugees living mainly in India; others are in Nepal, Switzerland, the UK, the United States, Canada and thirty other countries. In the past decade, the Dalai Lama has tried to open dialogue with the Chinese. He proposed a Five-Point Peace Plan in 1987-88, which would also stabilize the entire Asian region and which has drawn widespread praise from statesmen and legislative bodies around the world, but the Chinese have yet to enter into negotiations. Meanwhile, the Fourteenth Dalai Lama, unlike His predecessors who never came to the West, continues His world-wide travels, eloquently speaking in favor of ecumenical understanding, kindness and compassion, respect for the environment and, above all, world peace. The Senior Tutor to His Holiness the Fourteenth Dalai Lama, and Ninety-seventh Throneholder of Je Tzongkhapa, the great Yongdzin Ling Dorjechang, Jetzun Thubten Lungtog Namgyal Trinley Palzangpo, was born at the break of dawn on the sixth day of the eleventh month of the Tibetan Water Rabbit year (1903). His mother, Sonam Dekyi, gave birth to him at Yabphu, a holy place of Chakrasamvara and consort, northwest of Lhasa, Tibet. He is the sixth in his series of reincarnations. His predecessor, Sharchoe Yongdzin Ling Tulku, Losang Lungtog Tenzin Trinley, was the tutor to His Holiness the Thirteenth Dalai Lama. During his full meditational retreat on Vajrabhairava, lasting over three years, he composed one of his many well-known writings between sessions of his daily meditations. Called The Eighteen Rung Ladder of Vajrabhairava Ekavira, it was published by Tibet house, New Delhi in 1981. This is the most complete and authoritative manual available for the practice and study of Vajrabhairava, as this lineage is highly esteemed as the human manifestation of the deity Vajrabhairava himself. The Fifth Ling Rinpoche was in turn the incarnation of Ngawang Lungtog Yonten Gyatso, Tutor to His Holiness Khedrub Gyatso, the Eleventh Dalai Lama, and Seventy-fifth Gaden Throneholder. There are many other manifestations of the lineage of Ling Rinpoche extending back to the time of the Buddha. One of the foremost Tibetan Buddhist masters of our time, His Holiness Kyabje Trijang Rinpoche was the Fourteenth Dalai Lama's philosophical assistant and later his personal junior tutor for more than forty years. A direct disciple of the great Pabongka Rinpoche, Trijang Rinpoche edited Pabongka Rinpoche's Liberation in the Palm of Your Hand – one of the most-studied Lam-Rim texts in the Gelugpa lineage. 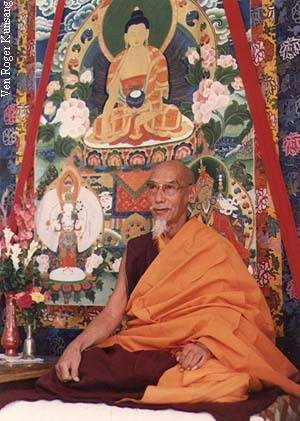 The spreading of Dharma in the West is directly and indirectly connected with Trijang Rinpoche, due to his own teachings, as well as the activities of his disciples, including Lama Yeshe, Lama Zopa Rinpoche, Geshe Rabten, Kyabje Zong Rinpoche and many others. Kyabje Tsenshab Serkong Tugse Rinpoche was born on July 27, 1914, in the area of Loka in southern Tibet. His father was one of the most outstanding masters of the last century, the great Serkong Dorjechang, the incarnation of Marpa the translator, his mother the incarnation of Marpa's wife Dagmema and Tsenshab Serkong Rinpoche the incarnation of Marpa's son Darmadodey. Tsenshab Serkong Rinpoche studied with masters from all the four major traditions of Tibetan Buddhism. He was a member of Ganden Jangtze Monastic University, where he received his Geshe Lharampa degree after fourteen years of study. He then spent nine years at Gyume Tantric College, where after passing all his examinations he held the position of Master of Discipline, before being appointed in 1948 one of the seven Tsenshab or Master Debate Partners to His Holiness the Fourteenth Dalai Lama. Tsenshab Serkong Rinpoche served His Holiness in this capacity for the rest of his life and imparted to His Holiness many lineages, initiations and oral transmissions. He accompanied His Holiness to China in 1954 and came in exile to India in 1959. In India, Tsenshab Serkong Rinpoche further served His Holiness in helping establish the Office of Religious and Cultural Affairs. He also served as one of His Holiness' main advisors, chief performer of his personal religious rituals, his teacher of Buddhist technical knowledge and skills such as mandala construction and his spiritual lieutenant for communicating and carrying out his policies. As a master of both sutra and all four classes of tantra, Tsenshab Serkong Rinpoche travelled extensively throughout India and Nepal to give teachings and initiations and help the monasteries re-start their rituals. He made five trips to Spiti where, in the manner of Atisha, he reformed and revitalized the monasteries and the Buddhist tradition of that remote mountain region. He also made two tours of North America and Europe. Taking on all obstacles to the welfare and works of His Holiness the Dalai Lama, Tsenshab Serkong Rinpoche passed away in full control and in accordance with his intentions, in the manner of the Buddha Shakyamuni, on August 20, 1983 in Kyipar, Spiti, India. In memorium, His Holiness has praised his former Master Debate Partner as a real Kadampa Geshe, someone who always remained humble in the truest sense. 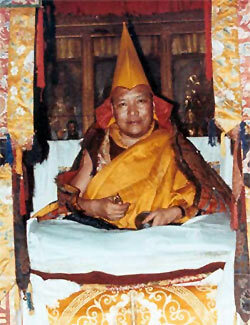 His Eminence Chobgye Trichen Rinpoche was head of the Tsharpa sub-lineage of the Sakya order of Tibetan Buddhism. He was the 26th patriarch of Phenpo Nalendra Monastary, founded by Rongton Sheja Kunrig (1367-1449). 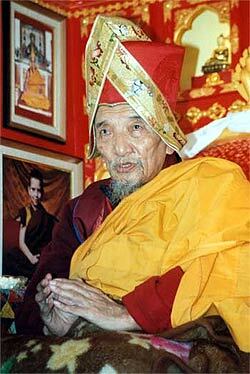 Born in 1920, His Eminence was recognized by the 13th Dalai Lama as 18th in the lineage of Chobgye Trichens. After going into exile, Chobgye Trichen Rinpoche built two monastaries: one in Lumbini, birthplace of the Buddha and the other in Kathmandu. Rinpoche is regarded as a master of masters; most Tibetan Buddhist lineage holders are his disciples, including His Holiness the Dalai Lama, His Holiness Sakya Trizin and the late Dudjom Rinpoche. Rinpoche conducted a series of three and a half year solitary meditation retreats for senior Sakyapa monks over the past fifteen years. 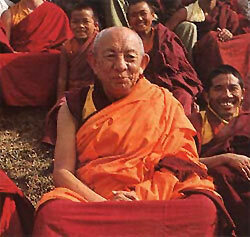 Rinpoche spent so much time in meditation retreat that he was regarded as a hidden master. One of the greatest living masters of the Nyingma tradition of Tibetan Buddhism, Trulshik Rinpoche is a leading proponent of the Rime, or non-sectarian, spirit of Buddhism. One of Lama Zopa Rinpoche's gurus, he lives in the Solu Khumbu region of Nepal, which is also Lama Zopa Rinpoche's birthplace. 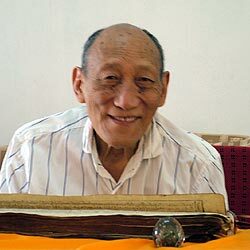 Trulshik Rinpoche was the closest and most realized disciple of the late master, Dilgo Khyentse Rinpoche. It was prophesied in Khyentse Rinpoche's visionary teachings (terma) that Trulshik Rinpoche would be the spiritual heir to his teachings, and in his absence, Khyentse Rinpoche referred all important matters to Trulshik Rinpoche. Upon Khyentse Rinpoche's passing in 1991, Trulshik Rinpoche was entrusted to find his reincarnation. He has visited the West several times to give teachings to fortunate students. His Holiness, Sakya Trizin, is the one of the world's preeminent masters of Tibetan Buddhism, and is the supreme head of the Khon Sakya lineage. Born in Tibet in 1945, His Holiness ascended to the throne of Sakya at the young age of seven, when he was recognized by His Holiness the Dalai Lama. Trained since early age of the various teachings of sutra and tantra, His Holiness is widely regarded as an emanation of Manjushri, the Buddha of Wisdom. Presently residing in Mussoorie, Northern India, His Holiness travels frequently around the world and is tireless in bestowing initiations and teachings to a growing group of dedicated disciples. His Holiness the Sakya Trizin has established important centers of learning and monastic practice in India and Nepal where the highly developed Sakya traditions of scholarship, philosophy, and practice continue in exile. Among these are the Sakya Institute, the Sakya College, and the Dzongsar Institute. After graduating as a high ranking Lharampa geshe at the age of twenty-five he moved on to the Tantric College of Gyuto. In 1937 he was appointed abbot of Shartse, a position he held for nine years. In 1959 he fled Tibet as an exile. Rinpoche referred to those days in Los Angeles last year, 'Due to our bad karma we lost our land and escaped to India. In India, for eight or nine years we were locked up in a forest, in a place where it was difficult to get around. 'Then, when I came out I was appointed principal at the Institute of Higher Tibetan Studies at Varanasi. His Holiness the Dalai Lama came to Buxa and requested me to take this responsibility. I couldn't refuse so I took the position.' After his work there was completed, Rinpoche moved to his old monastery Ganden Shartse in its new location in south India. Song Rinpoche first came to teach in the West in 1978, at the request of Lama Thubten Yeshe. He had been asked by him twice before, but had refused. Altogether he travelled to the West three times, the last two times staying extensive periods in America and Europe. Thousands of Westerners have received teachings from him, both in the West and in India. He forged strong links with dharma centres in America, Canada, England, France, Italy and Switzerland. 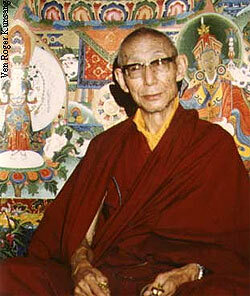 Geshe Rabten was born in Tibet in 1920. He spent twenty years first studying and then teaching at Sera Monastic University in Lhasa, until his exile in 1959. Upon completion of his training in India he was appointed as a religious assistant to the Dalai Lama. He also spent many years in solitary retreat, and wrote the book Song of the Profound View about his meditation experiences. 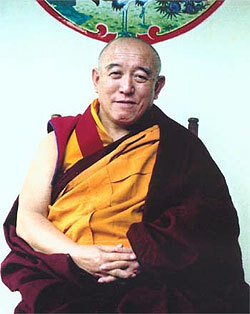 Since 1969, Geshe Rabten instructed Western students on Tibetan Buddhism. He was one of the first Tibetan Buddhist masters to give teachings in the West, and was one of the principle gurus of Lama Thubten Yeshe and Lama Zopa Rinpoche. He founded Tharpa Choeling Center for Higher Buddhist Studies in Switzerland in 1979 and resided there as a full-time spiritual director before he passed away in 1986. 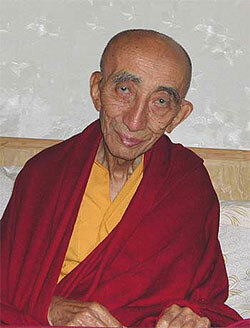 Locho Rinpoche is one of the few living high reincarnate lamas who was educated in Tibet. He is an expert on Manjushri's fierce form, Yamataka, and many other teachings and practices. Born in Kham, Tibet in 1928 and recognized at age six as the reincarnation of a famous scholar/teacher from the local Selkar monastery, at age eleven Locho Rinpoche entered Drepung Loseling Monastic College outside Lhasa, obtained his Geshe degree at age 25, and then attended Gyume Tantric College. In 1959 he fled to India, living in Sarnath for two years and then two years on a research fellowship at Calcutta University before becoming principal of the Buddhist School of Dialectics in Ladahk for six years. In 1967 he become abbot of a small monastery in Manali before moving to Dharamsala, where he now resides. He served as Abbot of the Dalai Lama's Namgyal Monastery from 1986 to 1991, and has visited the U.S. on several previous occasions, including one year teaching at the University of Virginia. Kirti Tsenshab Rinpoche was born in the province of Amdo – eastern Tibet – in 1926, and at age six was recognized as the reincarnation of the former abbot of the Kirti Gompa. At the age of nine, He was ordained as a monk. Rinpoche received teachings from many high Lamas of the Tibetan Buddhist tradition. Lama Kirti Tsenshab Rinpoche is one of the holders of the tantra of Kalachakra lineage, having received that empowerment when he was 14 years old. At the age of 32 and having completed his monastic studies he was appointed as the Abbot of Kirti. 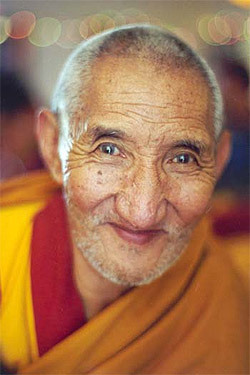 After escaping from Tíbet in 1959, Kirti Tsenshab Rinpoche taught Tibetan orphans at the Tibetan Children's Village, Dharamsala, India. At the age of 45 he began a fifteen-year meditation retreat in a small stone hermitage above Dharamsala, "big enough for a bed, prostrations, and a stove". He spent seven years in meditation on Lam Rim, three years on "Seven Point Thought Transformation", and some generation and completion stage tantra. Two years were spent only on generation and completion stages and in the final 3 years, Rinpoche repeated all of the above. Rinpoche has given Kalachakra commentary to His Holiness the Dalai Lama and is a teacher of Lama Zopa Rinpoche. Lama Zopa Rinpoche has said of Kirti Tsenshab Rinpoche, "He is a great Kadampa master who shows real Kadampa Tradition...so completely renounced. There's not one slightest worldy activity, not the slightest eight world dharmas, no self cherishing thought. Even talking, everything is as much as possible pleasing to sentient being's minds." Rinpoche gave teachings around the world in many countries included: Australia, Germany, Holland, Hong Kong, Italy, New Zealand, Singapore, Taiwan, and the United States. After demonstrating the appearance of serious illness for many months Kirti Tsenshab Rinpoche entered tukdam, the final meditation, at 2.30am, Saturday 16th December 2006 in South Delhi, India. The day of the 15th, which was Lama Tsongkapa Day - one of the holiest days in the Geluk callendar- , special offerings and prayers were offered at the house and in the evening extensive light offerings were made. During this period Rinpoche revealed just how we should practice when death approaches, with the same skill he has perfectly demonstrated how we should practice in all circumstances in this life. Geshe Lhundub Sopa, was born in 1923 in the Shang principality of Tsang in the western part of Central Tibet. He was ordained a novice monk at the age of nine and entered the famed Gaden Chokor Monastery. In 1941, at the age of eighteen he traveled to Lhasa, the capital of Tibet, and was admitted to the Tsangpa House of Sery Jey Monastery. 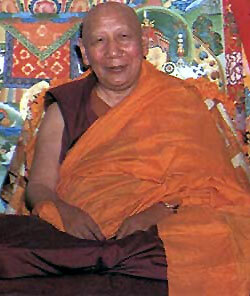 Geshe Sopa began teaching in Tibet at a very early age. Even before completing his own examinations for the degree of geshe, he was chosen by his Monastery as one of the Dalai Lama's debate examiners during the annual Prayer Festival in 1959. In 1959, Geshe Sopa sought political asylum in India. In 1962 he sat for the annual geshe examinations in Buxador, India and was awarded the degree of geshe with highest distinction (Lharampa). In that same year, H. H. the Dalai Lama appointed him tutor to three young recognized incarnate monks. The four of them moved to the Lamaist Buddhist Monastery in Freewood Acres, New Jersey. Geshe Sopa stayed here for the next five years. In 1967, Professor Richard Robinson invited Geshe Sopa to join the faculty at the University of Wisconsin-Madison. In 1973 he became Assistant Professor of Buddhist Studies, in 1976 he was promoted to the rank of Associate Professor, and in 1985 to Professor. He has taught Tibetan language, general courses in Buddhist philosophy and specialized doctoral colloquia on a variety of topics in Indo-Tibetan Buddhist thought. 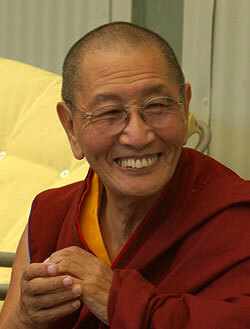 He is well-known for his insight into the Mahayana philosophy of emptiness. Geshe Sopa recently retired from his professorship at the University of Wisconsin in Madison. During this time at the university, many students began requesting private instruction outside of a formal academic setting – to meet this need, he founded the Deer Park Buddhist Center in Wisconsin in 1979. He is the center's spiritual head and director. In 1981 Deer Park hosted the first Kalacakra initiation to be offered in the West by His Holiness the Dalai Lama; since then, His Holiness has made five visits to Deer Park to offer scriptural commentary and initiations. Ribur Rinpoche was born in the Kham region of Tibet in 1923, and was recognized by the Thirteenth Dalai Lama as the reincarnation of the head lama of Ribur Monastery. After studying at Sera Me monastery, where he received numerous teachings from his root guru, Pabongka Rinpoche, Rinpoche received his geshe degree in 1948. Rinpoche was then confined in Lhasa from 1959 until 1976, during which time he experienced relentless interrogation and torture during thirty-five of the infamous struggle sessions. "If I told you what happened on a regular basis, you would find it hard to believe." At the end of the Cultural Revolution in 1976, Ribur Rinpoche spent more than 10 years in Chinese labor camps and was given a job with the Religious Affairs Office in Tibet. On one of his trips to China, he worked with the Panchen Lama and recovered holy objects – including the famous Shakyamuni Buddha statue in the Ramoche temple – that had been dismantled and shipped to China. He also re-established the destroyed stupa of Lama Tsongkhapa, which contained some of Lama Tsongkhapa's bodily relics. 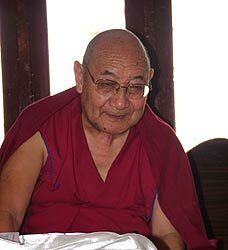 Since his exile to India in 1985, Ribur Rinpoche wrote numerous biographies of great lamas such as the Thirteenth Dalai Lama and an extensive history of Tibet, which includes his autobiography. Ribur Rinpoche spent many years living in northern California where he gave teachings and led retreats, before returning to India, where he passed away. Born in 1933 in eastern Tibet, Choden Rinpoche was recognized at age three as the reincarnation of the previous Rinpoche, who himself had been one of the candidates for the twelfth Dalai Lama. At age eight he entered Rabten monastery, and at age fifteen he went to Sera Je monastery, where he studied the five main texts. 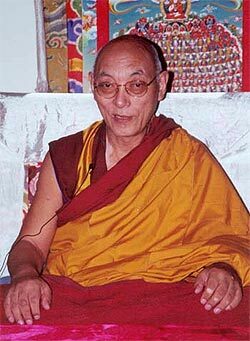 Although Rinpoche studied through the Lharam class and could have become a geshe, his teacher asked him not to take the exams yet. Choden Rinpoche decided to study the teachings on Vinaya – monastic discipline – and is regarded as one of the foremost experts on the subject. Choden Rinpoche was one of the two Sera Je lamas selected to debate with His Holiness the Dalai Lama during His Holiness's geshe exams. During the communist Chinese takeover of Tibet in 1959, Choden Rinpoche stayed in Tibet and went into solitary retreat for 19 years. He never left his tiny, dark room in Lhasa from 1965 to 1985, and was virtually unknown in his monastery for this reason. In 1985 he was allowed to leave Tibet for India, and has since taught for many years to thousands of students at Sera Je monastery in South India. At the request of Lama Zopa Rinpoche, Choden Rinpoche has now visited the west several times to give teachings and lead retreats. Ven. 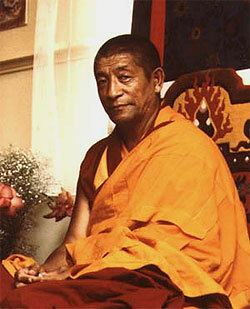 Bakula Rinpoche died while in India on November 4, 2003. He lived one of the more interesting lives of a Buddhist lama. Born into a royal family of Ladakh, India, he was later recognized by the Thirteenth Dalai Lama as a reincarnation of Bakula Arhat - one of the Sixteen Arhats (direct disciples of Shakyamuni Buddha who had tremendous spiritual realizations). Bakula Rinpoche had a keen interest in Mongolia and Russia from a young age, and while other Tibetan teachers were going to the West, Bakula Rinpoche said, "Everyone is going to the west - it's easy to go to the west." After Rinpoche worked as a minister of the Indian government under Indira Gandhi, he began to travel to Mongolia and the USSR, where he helped re-open ancient monasteries and organize Buddhist peace conferences. In 1990, was appointed as the Indian ambassador to Mongolia for a period of two years. When he arrived, Mongolia was still communist, but during his stay - which lasted more than 10 years - it became a free country, so Bakula Rinpoche could travel freely and work to revive pure Buddhism. After the fall of Communism in Mongolia, Bakula Rinpoche established monasteries and nunneries, hosted His Holiness the Dalai Lama, invited Lama Zopa Rinpoche several times, and granted ordination to many Mongolians. He retired from his position as ambassador in 2000. Interestingly enough, according to Mongolian folklore, there was a long-held belief that Bakula Arhat would one day come from India to revive Buddhism in Mongolia. Perhaps it wasn't folklore. Please make requests that he reincarnate s as quickly as possible . To carry on with his enlightened work may he reincarnate in the same aspect as Shakyamuni and Lama Tsongkhapa so that he can illuminate the dark and remove the ignorance of all sentient beings , spreading the precious Dharma and guiding us in all future lifetimes until enlightenment. Venerable Dhakpa Tulku Rinpoche is the recognized reincarnation of 49th Gaden Tripa Lobsang Dhargye Rinpoche, who was the head of the Geluk tradition of Tibetan Buddhism. Shelo Dolma gave birth to Ven. Dhakpa Rinpoche in 1926 in Kongpo in southern Tibet. When he was five years old he was recognized as the reincarnation of the 49th Gaden Tripa by His Holiness the 13th Dalai Lama. Soon after his recognition he was sent to Lhasa for his enthronement, accompanied by his parents and his assistants from his previous lifetime. He then returned to his personal Monastery Dhakpa Namdol Ling in Meldro Gungkar, north of Lhasa, where he took his novice vows and started memorizing his first prayers. When Dhakpa Rinpoche was ten years old he went to Sera Mey Monastic College and spent sixteen years studying Buddhist philosophy. When he was 26 years old he was able to sit for his Geshe examination successfully, and received the highest level attainable, that of Lharampa Geshe. In 1952 Rinpoche joined the Gyuto Tantric College and spent seven years studying all the Tantric rituals receiving the Ngagrampa Degree in Tantric Studies. In 1959 when the Chinese communists took over Tibet, Dhakpa Rinpoche, fled to India. In 1962 His Holiness the 14th Dalai Lama appointed Venerable Dhakpa Rinpoche as the Abbot of Sera Mey Monastery, the first Abbot of the Sera Mey Monastery in exile. Rinpoche took his place as an abbot for three years but due to his poor health he had to leave the Monastery and went to northeastern India for medical treatment in Kalimpong. During his stay in Kalimpong many local Tibetans made strong connections with Rinpoche through his spiritual teachings and blessings. Until 1990 Rinpoche led a very quiet life in Kalimpong and spent much of his time in retreat and meditation. Although Rinpoche is one of the most precious and valuable spiritual teachers living in India, due to his humble nature and personal practices, he was little known outside his area. 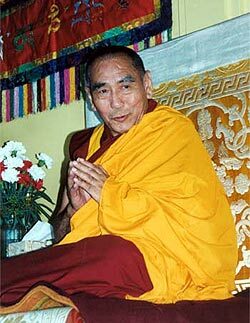 However, he is in fact one of the very rare teachers holding teachings from the most valuable and precious secret lineages which he received from Pabongka Rinpoche and many other highly realized reincarnated Lamas in Tibet. Throughout his life Rinpoche has actively sought out teachings from spiritual masters from other Tibetan Buddhist traditions which adds to the richness of his understanding and teachings. It is now time for him to pass on all these secret lineages to the young Lamas and Geshes before he gets too old. Therefore, Rinpoche was requested to pass on all those teachings and other Tantric initiations to the young Rinpoches at Sera Mey Monastery, which he does for three months every winter. His Holiness the Dalai Lama has praised Dhakpa Rinpoche for his dedication to his practices and the generosity of his teachings. 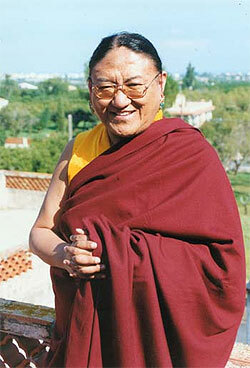 Khyongla Rato Rinpoche is a reincarnate lama and scholar of the Gelugpa order of Tibetan Buddhism. Rinpoche was born in the Dagyab region of Kham, in southeastern Tibet. In 1928 senior Gelugpa monks divined that a five-year-old boy living in this remote part of Tibet was the reincarnation of the ninth Khyongla. On his sixth birthday monks on horseback took him from his parents home to a monastery some distance away where he was installed as its spiritual head. For over three decades he lived the life of a monk, studying at the most famous monasteries in Tibet and earning the Lharampa Geshe degree. In 1959 along with thousands of monks as well as the Dalai Lama, he fled on foot over the Himalayas to safety and to a radically different life in India, Europe and eventually in the United States where he now lives as a lay lama. In 1975 he founded The Tibet Center, the oldest Tibetan Buddhist Center in New York City, USA.